It’s very hard to get it through your head to not worry about things because it’s a habit that most of us don’t consciously control. But you see, in reality, the average person DOES have all the power in the world to control their worries and do you know why? Because 99% of the time, worrying is pointless and solves nothing. Think about most things that you worry about and how they usually fit into 1 of 2 categories. 1: Things that are beyond our control like who wins an election. You can cast your vote for a candidate in an election but that’s about it. You can’t control the mindset of the world so really, all you can do it accept the fact that you must make the best of the situation regardless of the out come. Besides, is it going to greatly alter your everyday life? Probably Not. 2: Things that we do control and can take action with immediately like worrying that you don’t have enough money to pay this month’s mortgage. Worrying about paying the bills can easily be resolved if you take action and write out all your income and expenses for that month and then analyze where each dollar will come from to pay the mortgage. I’ll get to this in more detail in an example below. There is one question to ask yourself when you start to worry… you should write this down and carry it with you so you can always pull it out and ask yourself the question next time you start to worry! If Yes, it can be remedied: Take action! Figure out what you need to do in the long term or short term to resolve the situation so you don’t worry about it again. If No, it can’t be remedied: It's probably beyond your control. Either it already happened and is in the past (you messed something up and now you're worried it will affect your future), or it’s something bigger than you… like something in politics or a world event or natural occurrence (a blizzard coming your way). 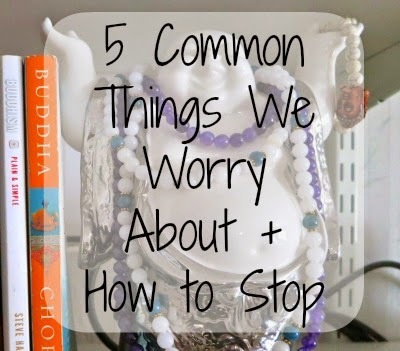 To show you how effective this is I’ve chosen 5 common things that people worry about in everyday life. Then I will explain how you can train yourself to stop worrying about it and be productive and positive. What if this relationship doesn’t work out? The thing with this one is that it’s actually normal to worry about this in the beginning of any situation where you have met someone knew and start to feel something for them. This is actually a beneficial worry because it can help you determine if someone's red flags mean that you should avoid a relationship with them. The key here is to ask the question right away, and in the future, don’t even get involved with someone if you know you can control your decision to deal with them. On your end of the relationship do your best to resolve issues that arise. Address them and work them out. If your partner is not willing to do the same, then you know that it’s time to possibly consider getting out of the relationship so you don’t need to worry about the relationship not working out further down the road. If no one compromised in life, none of us would interact, in fact our species would probably die off because we can’t even coexist and reproduce. Compromise is a great way to resolve issues and ensure a successful relationship between two people. In the future, be sure to ONLY get in a relationship when you feel it’s right and can be long term. Don’t end up with someone that has MAJOR red flags in the beginning like a past filled with relationships he was afraid to commit to, or someone that seems like a serial dater (aka a player!). What if I don’t get the position I interviewed for? Of course you will stew over this the second you walk out of that job interview, wondering about the worst case scenario. The key is to be realistic and optimistic. No because in the end it’s NOT your decision whether you get hired or not, so all you can do is hope for the best. Yes, because you can make sure you dress appropriately, have a good resume, and a positive friendly attitude. On your end, make sure you dress appropriately, have a good resume, and a great attitude for your interviews that way you know that you put in the effort and the decision is ultimately up to them. What if this event/party/meeting I’ve organized doesn’t go as planned? Of course this is always a concern, and it's almost instinctive to think of the worst case scenario as you plan something out so that you can be sure every base is covered. This can be beneficial for example when you are making sure there’s a vegetarian option for the catering company so that a coworker has that option when it comes time for lunch during the conference. Can this be remedied? Yes, duh. This way you can reassure yourself each time you start to worry. What if someone can't eat meat? Oh wait, I ordered vegetarian options as well, nevermind! In the future cover your bases and plan out the possibilities of what could go wrong and how you can plan ahead for them. That’s why party planners can keep their cool before hand, and panic usually only sets in DURING the big event as things start to go awry. I mean you can’t possibly have known that Uncle Charlies would get SUPER drunk before you walked down thea isle, thus causing a distraction to the guests. This may seem vague and it is! Yet it's still such a huge deal for most people. This is generally something that deals with yourself as a person, like I want to be the best girlfriend/boyfriend I can be, but what if I mess up? A lot of people worry because they tell their partner that they promise to not hurt them… but then they say that it’s hard for them to make promises if they can't control if something they do unintentionally may hurt the other person? First of all, that’s kind of selfish. Be the best you that you can be and understand that when you tell someone it will be okay or that you will make them happy, remember that you are promising that to the best of your abilities. So if you had no idea that your girlfriend didn’t like gambling, it’s not your fault that she was upset because you lost A LOT of money at the casino. Had you known better you would have been more careful (hopefully). Yes, be the best you that you can be ALWAYS and don’t be afraid to give someone your word, just carefully choose the way you say it. Instead of saying I promise to never hurt you, change it to a positive and more realistic statement like “I promise I will always do my best to make you happy.” It means the world to a person when you make a statement like that. It’s very reassuring and it makes the other person feel loved, respected, and cared for. In the future… do your best, think before you act, and don’t hold back. Don’t be so hard on yourself! People make mistakes and that’s part of life. So learn from it, and think of it this way..if you do let your partner down, vow to talk it out and then do even better in the future. What if myself or someone close to me gets seriously ill, injured in an accident, or dies? The question itself refers to three things that most people can’t control. You can control how cautious you are in life but you can't control the actions of others. You also can’t control mother nature or fate. Can this be remedied? Yes and no. Yes, you can always take steps to be safe and cautious in life, like being healthy with food and exercise, being safe by following laws, rules, and wearing safety gear/seatbelts. Plus, you can always try to be on top of things like your health and wellness so that if something DOES come up, you can nip it in the bud. No because there are some things that just happen, and it’s not fair, but you can’t let the world get the best of you by worrying about it before it happens. A person can worry that they may get cancer someday but aside from being healthy and taking care of themselves, they have no absolute way of preventing something like that from happening. Keep Your Mind in Check. If you worry about something happening to another person you have to remind yourself that you can't protect others from life. They have to do it themselves. All you can do is teach them the right ways, and then have faith. In the future keep in mind that you really never know when life can be cut short, so make the best of it so you have NO REGRETS if something does happen. Spend time with your loved ones, tell them how you feel, and don’t be afraid to express feelings to those around you! Great advice! It is so easy to worry about things that we can't control! Looking forward to putting some of this advice into action. so glad you enjoyed this post. Hope it helps you!